Near the end of Graham Carter’s documentary “Blue Flame”, Al Julian of the Woody Herman Society laments that Herman is not remembered along with established big band giants like Duke Ellington, Count Basie and Stan Kenton. I’m not sure that I agree, especially in light of several respectably-selling Mosaic reissues of Herman’s recordings, and from the warm recollections of his band members in Carter’s film. There’s no question that Herman’s fan base is getting older, but Herman was always good at attracting young audiences to his music. More than any other bandleader of the 1970s (save perhaps Maynard Ferguson and Buddy Rich), Herman embraced the rock and pop music of the time, and performed to college audiences who were nearly the same age as his band members. And of course, the same thing could be said of Herman’s Second Herd of the late 1940s, which, as Dan Morgenstern notes in the film, was one of two big bands of the time that developed big band bebop (the other was Dizzy Gillespie’s). Carter’s film discusses Herman’s career chronologically from his beginnings as a vaudeville saxophonist through his apprenticeship with the Tom Gerun and Isham Jones bands, and then moving through each band Herman led on his own. There is an impressive roster of band alumni in the film, including Bobby Shew, Joe Lovano, Phil Wilson, Med Flory, Joe LaBarbera, Nat Pierce, Frank Tiberi and Ralph Burns. Herman is also featured in vintage interviews, and Carter fills in the gaps with his own narration. The historical angle is much stronger than in his film on Stan Kenton (which had several glaring mistakes), thanks to the presence of Morgenstern, longtime Herman supporter Herb Wong, Herman’s biographer Bill Clancy and one of jazz’s finest musician/historians, Jeff Hamilton. There’s no shortage of classic film clips of the Herman Herds, but Carter has found several rarely seen gems, including a 1949 small group appearance on Ed Sullivan’s “Toast of the Town”, a hip adaptation of Horace Silver’s “The Preacher” from the 1956 “Timex All-Star Jazz Show”, and several performance clips from the 1976 PBS documentary “Woody”. Most of the clips are shown complete, without voiceover narration or interviews. Unfortunately, Carter does not identify the soloists in each clip, so the novice viewer may miss the rare film appearance of Serge Chaloff on the 1949 Sullivan piece, or Phil Wilson on a burning “Caldonia” from a 1963 Sullivan show. 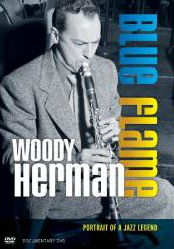 The film was produced with the cooperation of the Woody Herman Society and the Woody Herman estate, so it’s not surprising that unpleasant elements of Herman’s life—such as his large yet unintentional debt to the IRS–are not discussed in great depth. And it seems to me that Carter and his subjects shy away from the mixture of classical and jazz forms: on the Kenton documentary, Bob Graettinger’s “City of Glass” is discussed briefly and in mostly negative terms; Igor Stravinsky’s “Ebony Concerto” for Herman’s band fares a little better, but couldn’t someone have talked a little more about this important piece and the experience of working with one of the giants of 20th century music? At 110 minutes, Carter’s film seems a little long, but the musical examples keep the film flowing and provide ample proof of Herman’s consistent musicality. Apart from a few rough edits in the transitions and a couple of interview segments that seem misplaced, the film has a professional look and the DVD includes chapter stops for all of the performance clips and important historical segments. With Herman’s centennial coming up next year, Carter’s documentary offers a great way to start the celebration.